During the fall and winter I tend to stick with dark coloured clothing. Today I went completely outside of my comfort zone and wore off-white head to toe. I almost had a total fashion faux pas this morning. I had no idea what I was going to wear so I put on my undergarments and did my makeup as usual. Ooops. I was wearing a black bra and red underpants which you could see perfectly clearly through these clothes. So everything came off, out came the beige underthings, and everything was put back on. Proof that advance planning is essential! Yesterday's skirt? It's in my donate bag. It was just too big. I thought about taking it in but it was cheap so I can surely find something better. And Sheila very wisely said "that black pencil skirt has to go! It's doing bad things to your bum, missy". This skirt does better things for my bum, if I do say so myself. These pantyhose? So cool but they're in the garbage now. I got a run in them today. :( Oh well. Recently I won a $100 gift card from Peek Brooklyn so I'll be getting some new fun tights soon! Yes, the bum is indeed looking peachy, Megan! Skully white skirt! This is what I call "white goth". Something edgy in white. Really hard to find, but used to be my biggest obsession. Sorry about the tights! Hope you find some fun new replacements. Black skirts are a dime a million, I know you'll find a new one. Your outfit is stunning. I'm in love with the stockings. Yay, bum happiness! Lol! I have a black velvet pencil skirt (unlined, cotton velvet, Armor Jeans (a Le Chateau brand)) that I love but am probably doing to dump. It's to the knee. You interested? I can send you pics/size (my size, around 6-8, I think). 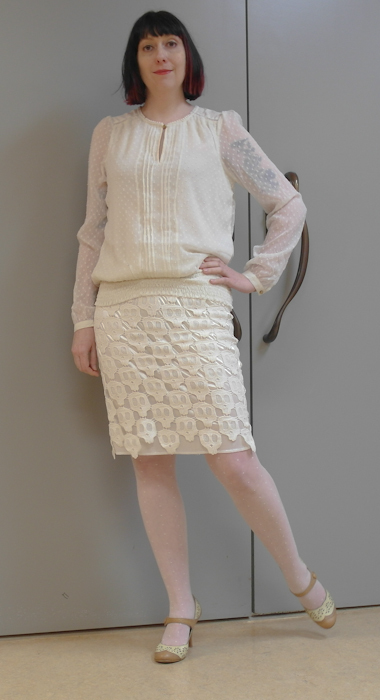 LOVE that skirt so much - and love the term "white goth". I need to do some white goth. Great outfit, Megan, one of my all-time faves. Love this. I always feel so "sophisticated" in winter white head to toe. White goth - I love that! White is the new black. The outfit looks beautiful. You look like you're floating on a cloud. Gorgeous! You look very good in winter white. Can I take your donation bag to the Goodwill? I can't promise that I won't fish out that skirt! I love it! You look wonderful in white. I also struggle with light colours in winter. You look absolutely stunning. And your bum is happily cupped! (is it ok to say that?). I dropped some weight recently and some clothes are now just too big. Good to let the black skirt go. I love this skirt sooo much! You mentioning the see through issue, reminds me I don't have any white underwear. I must resolve that, one never knows when an all white outfit is too revealing!